The southernmost geographically monastery of the Holy Metropolis of Messinia, between villages Vasilitsi and Chrysokellaria, in the Municipality of Koroni. Chrysokellaria, built originally in the 17th century, destroyed by Ibrahim. The church is Basilica, built in 1864 and is dedicated to the Assumption of the Blessed Virgin, but celebrates the Holy Trinity. Nunnery (1 nun, named Pagratia). Tradition says that the reredos was made many years ago by a timber ot a half-destroyed sailboat, which washed up on the sea coast of Koroni and the Monks built both the Temple and the church’s icon. The Monastery of Chrysokellaria during its life, once was at its peak and activity level and a decline after left no monks. For one hundred years (1852-1952) was a dependency of the Monastery Voulkanou as a male monastery until 1952 when converted into a convent. The new wing with cells west of the church began in 1971 and since 1977 has no nuns. The Chrisokellaria connected by road with CHAROKOPIO (5 km away) associated with the route of the bus, twice a day from Monday to Friday. It has an estimated population of 570 inhabitants. 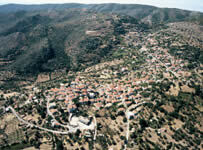 It consists of two settlements the Chrisokelaria (528 inhabitants) and the Holy Anargyrous (42 inhabitants). You will quickly reach Vasilitsi. In the past it was called Saratsi considered as one of the villages of Pylia with a long history. 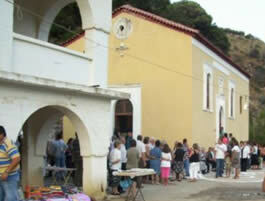 The village is ideal, as it is located between two hills, with spectacular views to the sea. On one side of the village, there are groves, farms, mountains, and other great beaches, such as Beach Tsapi, the small and the large Marathi and Glyfada. The Saratsi built around 750 AD by Nomads Slavs and Greeks from other regions, who came to this region. A few years later we moved a tribe Greek origin of “Vlachs” who came from the mountains of Pindos, while around 1420 arrive in organized groups from Aetolia Arvanites of Epirus, who settled in the area and clashed with the first inhabitants, even with the Venetians, who were dominant in the region. After 1470 Greeks and Albanians longer considered as a people and the descendants of these tribes united among themselves and with the first residents Chrysokellaria brought out the Revolution of 1821. From Chrisokelaria passed Kolokotronis, who left from Marathi to Zakynthos. Changing the name to Chrisokelaria. The name Saratsi lasted until 1927. Then by decree renamed Chrisokelaria the homonymous monastery situated just 2 km southeast of the village tucked into the cavity of a hill. Next to the temple there is a large guesthouse and a tap, a few meters from the church.